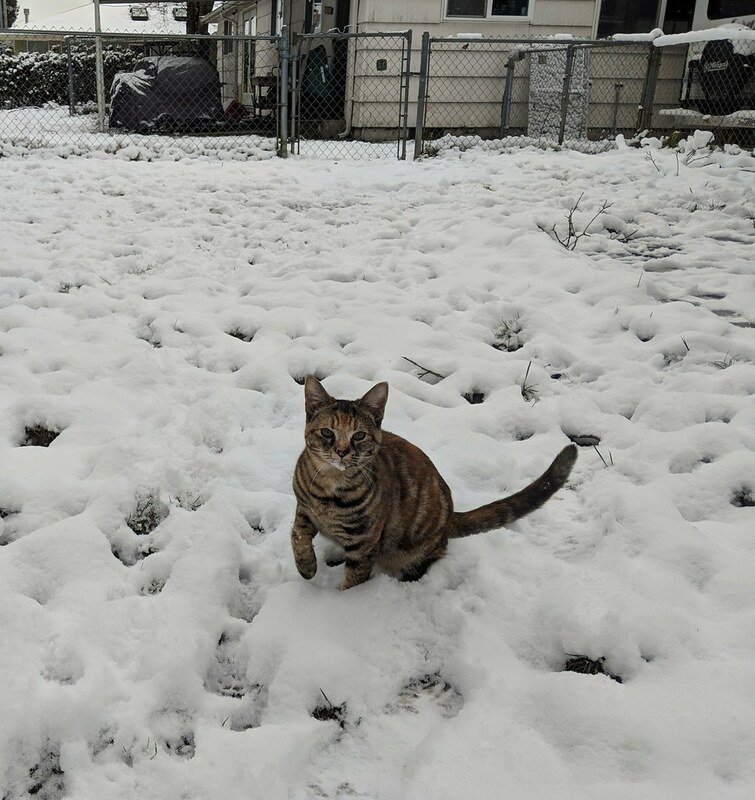 We had snow overnight Sunday into Monday, and since that is a rare occurrence in the Seattle area, and we have many hills (less for me now that I live in Auburn, though), it meant that everything has been closed for the last two days. And snow days mean sewing time! Over the weekend, my organdy order arrived, and I made a petticoat to go with the Fairy Godmother dress. I didn't have anything big enough/the right shape to go over my cobbled-together crinolette, so I used the Truly Victorian bustle petticoat pattern as a base. I used the three main pieces relatively as is, lengthening them by 3" and widening the back pieces by about 3" each as well. I added three tiers of ruffles on top of the back sections to add more oomph. 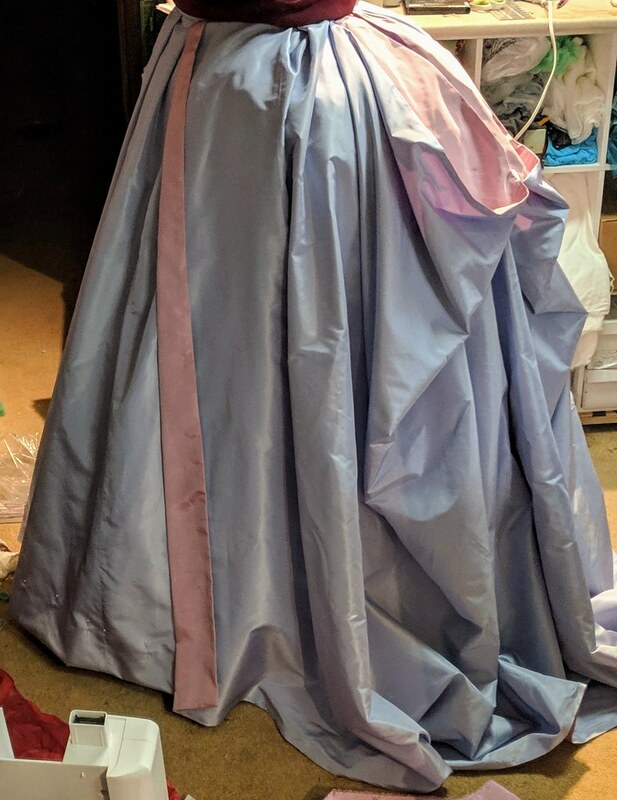 And then I decided to rip strips of the organdy and use my ruffle foot for the two additional tiers of the petticoat (in addition to the ruffles on the higher back sections), so I don't know exactly what the math worked out to, compared to the actual pattern. 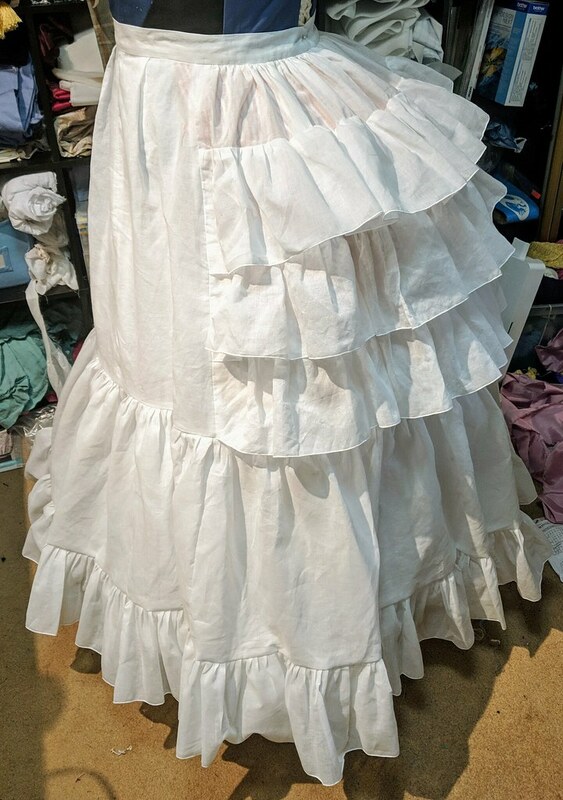 And I'm still not sure it's entirely done, mainly because it is shaped to go over a bustle, not a crinolette, so mine is pretty high off the ground in back, and I may add another ruffle to the bottom of the back that tapers off to nothing at the sides. But it's done for now! After I finished the petticoat, I pleated up the skirt and put it and the overskirt on the same waistband. Once I finished it and pinned up the hem, I realized that the overskirt was not coming far enough around on the sides. So I undid that section of waistband, undid a pleat on the overskirt, and moved it about 2.75" farther along on either side. Then I tried on the skirt, and realized that it was 1 7/8" too big around the waist, and I couldn't just have a bigger overlap because of the overskirt. Gah! So then I undid the CB of the waistband, made a CB seam in it, removing that extra length in the waistband, and increasing the back pleats. But because I kept having to redo the waistband, I'm sure I wasted a good 2 hours. Really frustrating! Anyway, it's done now, and I stayed up late on Monday night to finish hemming the whole thing. Yesterday, I marked where the pleated tiers go on the front of the skirt, did the math, and found out that I don't have enough fabric. Ugh. I need 51" length x the entire width of fabric, because the front is wider than I had estimated originally. And I'm almost 100% certain that there's no way that I can get the bodice and those tiers out of the fabric I have left, let alone the bodice trimming (or the evening bodice I was also thinking about making), since I have about 2yds left. Val has said that she can check the fabric district for me when she goes in a couple weeks, but in the meantime, I'm going to make the day bodice first, so that I know exactly how much is needed. But before I start that, I decided that I should really finish cutting out/fitting the mockup for the plaid 1880s bustle bodice, whose skirt has been hanging there mostly finished since the end of December. So that's what I did yesterday evening. I only had a few small tweaks that needed to be made to the pattern, so now I just have to take it apart, transfer those tweaks to my original pattern, and cut out the plaid fabric. And I can use my mockup as the flat-lining, which is nice. Hopefully I'll be able to finish that bodice this week. I'm going to try to use much of the same base bodice pattern for the Fairy Godmother, too, though I'm going to attempt to turn it into a two piece back instead of a three piece, since that's really obvious in the extant one. But anyway, work reopened today, so the next few days will probably be quite busy between work, gigs, rehearsals, and auditions. That said, we're expecting more snow on Friday night, so who knows what might happen? 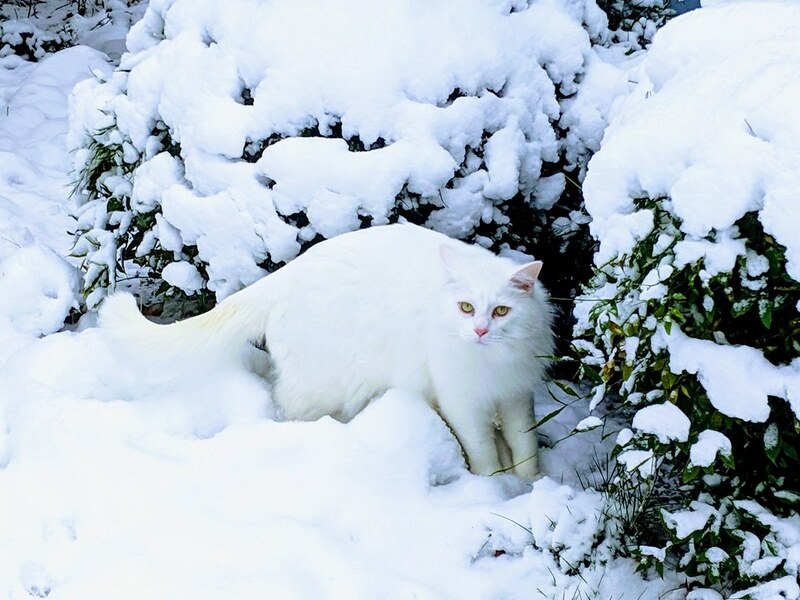 Here's some cats in the snow pics. For some reason, the ones of Lion and my yard are refusing to upload to Flickr, but you can see more on my facebook if you want. Next petticoat I need to remind myself: organdy. Good luck on your fabric search. Yep. Have you used it before? Nope. One of the reasons I want to try! It's nice and floofy, but it does not like to have a straight grain. I definitely prefer ripping organdy (it will rip in both directions) to make sure I have a straight grain.